In this week’s edition of Household Energy Audits, we visited a charming residence and were able to provide helpful improvements to another local homeowner. Cindy’s home had comfortable rooms for her grandchildren, pleasant furnishings and a spacious back yard. In contrast to most homeowners, Cindy had already implemented energy-saving measures such as thermostat control, timed showers, and line-dry laundry. However, she still complained of drafts coming from door frames and window areas, and energy bills that went through the roof. Using our Blower-Door tester, we were able to pinpoint many of the leaks and seal them with either caulk or expanding foam. In addition, the larger frame-door gaps in the front and back doors were remedied by installing rubber weather strips. While the stuffed animals lining the doors were cute, an even cuter presence will be the added warmth her whole family will get from the new door seal! Cindy mentioned that she consistantly had to cut her hot water with cold, an issue we were able to meet by simple turning her central water heater down by about 10 degrees. On the issue of water usage, Cindy was already quite adept. However, we were able to augment her thriftiness by installing low-flow shower heads and sink nozzles. These provide adequate pressure for functionality and comfort, while noticeably reducing overall water use. Since Cindy’s grandchildren are not always there, we suggested that she close heating vents in unused rooms. This is a simple step that can be done at home, usually even by those physically impaired. We were able to replace many of the home’s lightbulbs with Compact Fluorescent Lights (CFL), which provide solid light coverage at a fraction of the energy cost. For the long-term improvement of Cindy’s home, we suggested the installation of blow-in foam insulation in the attic space. While there was a large amount of family items stored in the attic, Cindy expressed a longstanding desire to have these items removed or placed elsewhere. Blow-in insulation is perfect for attic space that is already difficult to access (therefore only presenting heat inefficiency), and can drastically reduce monthly energy bills. By the time we had finished, Cindy was in high spirits, eager to implement more energy-saving tips for her own home, and to spread the good news to her friends in the community. Another home improved, providing comfort and education to our valued local citizens! The above picture is of the EYES building which was previously used as a county storage unit. Week Two: We are making progress! In our second week of EYES, we began to understand the dynamics of the program: how it works, what is expected of the kids while they are there, the goals of the program, and our roles as a part of it. Everyone at EYES is warming up to us and beginning to accept us as a part of the program. As long as we stay true to the goal of ensuring the kids have a better future then they are happy to have us. Problems: Some of the kids, as we expected, are attention starved. From the moment we arrive for the afternoon, they attach to us and demand our attention. Most of the children are outgoing and have huge personalities, but their academic understanding, in some cases, is not where it should be. Nutrition is also an issue. Though the program does what it can to provide snacks for the children, from what we’ve seen the snacks are, for the most part, salty crackers and sugary drinks. Lastly, we fear that the kids can’t see beyond S. Pittsburg and the fact that the reality that they are growing up in does not have to be their own. So, we want to show them the world outside of S. Pittsburg and inspire them to aim high in their goals. Most of these problems are fixable, and over time we hope to address some of them. The Future: In the future we hope to show the kids some of what is outside S. Pittsburg. We are planning field trips to the Mountain for sporting events, Perpetual Motion, and hiking. We also hope to finish out the school year with one big field trip to Chattanooga. We also are planning fundraisers to cover the expenses of the field trips and to help lighten the load placed of the people who keep EYES running. Our last goal is our largest and most challenging because we want to begin the process of attaining a grant for EYES. This will involve countless hours of research and writing but we feel that a grant is the only way to ensure that EYES will have the funds necessary to provide for these kids. We are all super excited for the upcoming weeks and hope to start planning field trips! Yesterday, Hadlea and I made our first official foray into North Elementary! The kids were all very exciting and engaging. We thought it best to spend the day getting to know the children we would be working with. After introducing ourselves and telling them a little bit about us, we got a feeling for the kinds of sports and activities they would be interested in– football, by far, proved the most prevalent. Floor Hockey, Basketball, Baseball, and Softball were all quite popular as well, however! We’re super excited to start actually doing some exercise next week– and more importantly, the kids seem to be as well! Linnea and I are learning that service is a 2 way process. Our CE involves writing articles in the lifestyle section of the Grundy County Herald. I’ll keep matters short and sweet, so you can check out the actual articles, but here’s some background information to update y’all. Last week, our group made our first forays into North Elementary. On Wednesday, we met with both Ms. Garner and the P.E teacher with whom we will be working. Both have an amazing sense of enthusiasm and excitement—qualities which, they assured us, the children share as well! While we were unable to start immediately, the groundwork for our entrance into the school has been laid, and we are almost ready to begin the actual program. During our meeting, we discussed many of the features that will make up the afterschool program; perhaps, most interesting of these is the incentives goal. Each student will be equipped with the basic tools to start their journey towards healthy living: a backback, water-bottle, and pedometer. These are all gifts which have been made possible by Ms. Tonya’s grant (40,000 each year, for 4 years!). It’s important, however, that this money is spent conservatively—while it does, and is indeed, good deal of money, pennies are quick to become dollars. We left this meeting with a refreshed sense of purpose. Not only were we excited—the rest of the community was as well! The local police officer was quick to offer his services, and was soon on the telephone with all of his friends. We really think this will be a great way for not only Sewanee to engage the community, but for there to be new links built within this area as well. On Thursday, we came together again to review our progress thus far and refocus our future goals. While we’ve really made a good amount of logistical inroads, we’ve yet to actually begin our work in the schools. We’re still not completely sure whether this will be an effort focused mostly on North, or if spreading our engagement will lead to a better result. In the end, we all decided that this is best left to the decision of Ms. Garner and that we are here to help in whatever way possible. We also discussed the possibility of bringing the children to Sewanee for a walk—a potential field trip which sounded very exciting! While we still have much work to do, I think we have made some really great progress so far. As long as we stay committed and focused, I don’t know how this couldn’t work out! 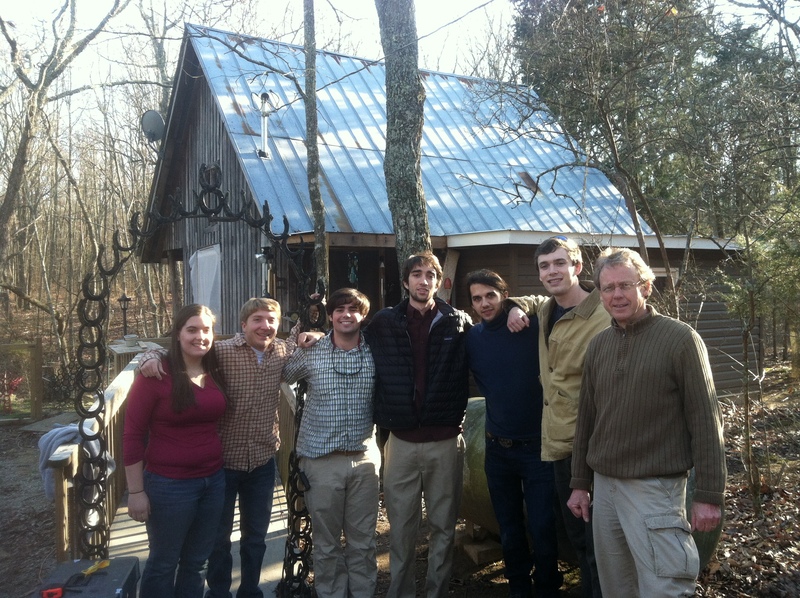 Our first energy audit was a group training session at Daniel Church’s house on January 31st. Daniel and Dixon Myers taught us the basics of energy audits, how to find and fix problems around the house. There is a range of possible fixes to help residents conserve energy and lower energy costs. 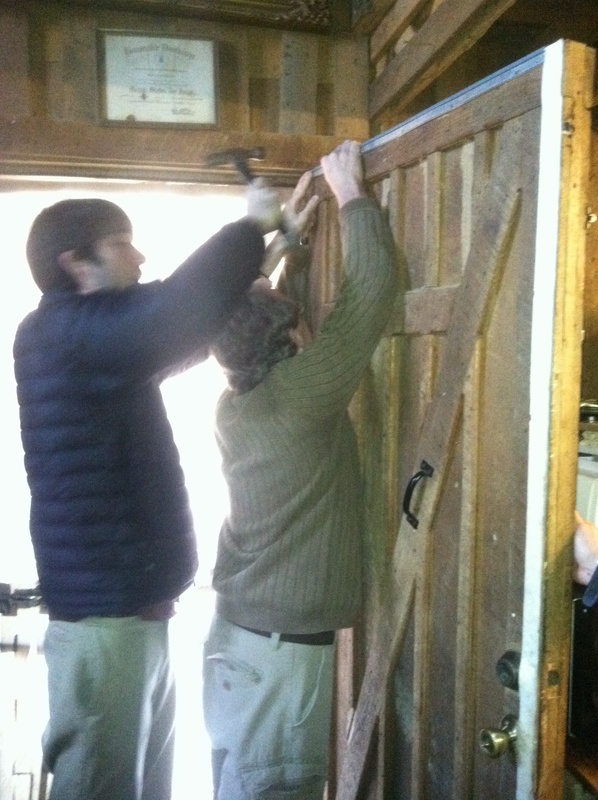 This week, on February 14th, we did our first energy audit at cabin house, slightly past Saint Andrews. Mike, the renter of the cabin, was an older man who had one foot amputated about two years ago. He was living on disability income from the government and explained to us that he barely had enough money to pay for groceries. It was interesting to see that despite his extremely low income, Mike had a large flat screen television and computer, along with 4 dogs and 5 cats. Mike identified some of the places of energy loss in his house, and with the help of the blower door test, we were able to identify more. We were able to fix a hole in a cabinet under the kitchen sink by replacing degraded insulation, both inside and outside (see picture of Ben). We also replaced a panel on the outside of the house to cover the exposed insulation. Then, we added weather stripping to the back door. Before we installed it, day light could be seen through the seal, or lack there of, between the door and the frame, but the weather stripping block the sunlight, and some of the air flow as well (see picture of Ben and Dixon). Two other simple fixes to conserve energy were caulking some of the leaky windows and replacing incandescent light bulbs with CFL’s. 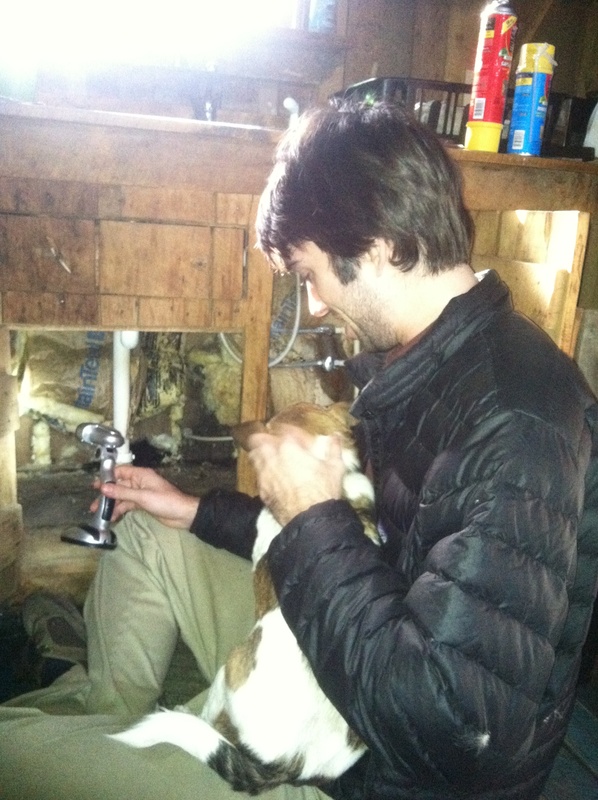 Overall, I think this was a great first energy audit out in the field. Our team worked together well, and I was glad that Dixon and Daniel were pleased with our work. Although the job required some physical labor and getting a little messy, but we, or at least I, enjoyed the companionship of my classmates as well as the satisfaction of making someone else’s life a little better, and helping Sewanee and the surrounding area become a little more sustainable. Our first two group meetings with Mrs. Tonya Garner were wonderful! We are all so excited to begin putting the walking program into full swing. 46% of Grundy County school children are obese and knowingly only participate in 90 minutes of Physical Education class in school. We will be working primarily with North Elementary in Grundy County in coordination with their LEAPS afterschool program to address these statistics. There is not an official name for our program yet. Though Mrs. Tonya has suggested Activ8 Grundy, we are going to let the kids we work with help us invent a slogan they can become really excited about and feel a part of! Mrs. Tonya was able to receive a grant of $40,000. Unfortunately we are only able to give $5,000 to building a walking track at North Elementary School. So to raise the other $15,000 needed to build the track, we are going to host a 5K run in May. We hope to have local donations and sponsorships to raise the money, as we will not be charging a registration fee. Additionally, we have $6,000 to spend on incentives for the kids, such as water bottles with our logo on them, journals, travel bags, etc. One of the most important aspects of the project will be having the kids log their activity in a daily journal. This will teach them responsibility, and it will also allow us to show evidence that the program works and could be applied on a larger-scale. This being said, we hope to be able to eventually involve Coalmont and Tracy City schools and communities as well. We are going to incorporate some nutrition education and give two presentations on diabetes. The first presentation will hopefully be in school during a pep-rally! Our goal is to educate the students about diabetes in a way that their age group will understand. If we have time we might also hold games and relays to keep their attention and make it interesting. The second presentation will be held at the school so that we can educate parents about diabetes and nutrition, as well. This is especially important because they are the ones in the household who buy the food for the children. To draw them in we will allow them to bring their kids to play as well as feed them a meal during the presentation. Parent fun night! Another aspect of the project we hope to include is church involvement. 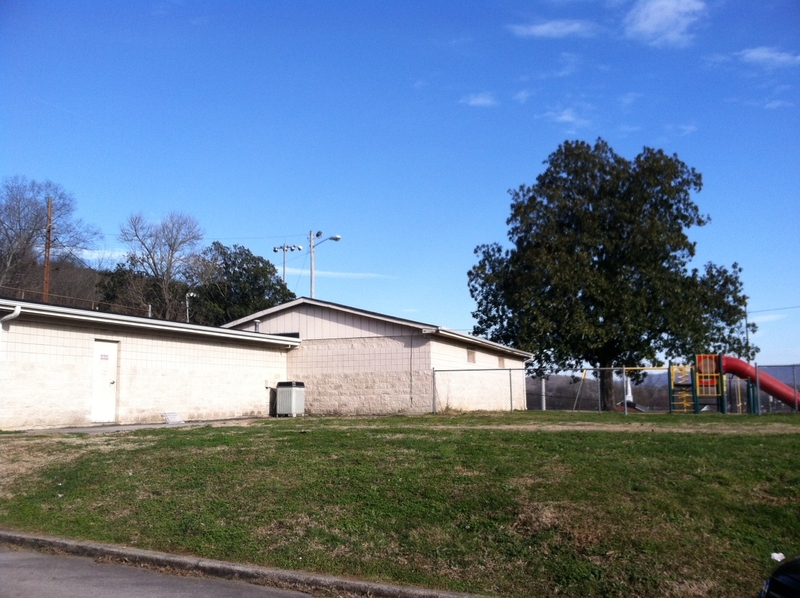 According to Tonya, Grundy County has specific churches that have expressed interest in helping us get the feet of our project off the ground. We hope to involve them by presenting ideas for youth groups to run or participate in the 5K, having potluck dinners at the church, and getting the churches to encourage the children and families to begin their journey to a healthy lifestyle. We find it very important, also, to start closing the gap that lies between the Sewanee community and those communities around us. We hope to advertise the program all over Grundy County as well as in Sewanee. To strengthen the bond, we are thinking of taking the kids on a field trip to Sewanee to hike, see a show, or just to see where we live. There will be more details and concrete plans as we move through this process. For now we are all looking forward to our next meeting on the 13th of February at North Elementary to introduce ourselves to the school and the children whose lives we hope to change. New Games at Tracy City!